Players, coaching staff and administration of FC Zhemchuzhina-Sochi have visited the construction site of the Olympic stadium in Sochi on Saturday May 21 within the campaign of support to Olympic movement and propaganda of sports and patriotism. The Olympic stadium will host the opening and closing ceremonies of Winter Olympics 2014, games of the World Cup 2018 in Russia and home games of FC Zhemchuzhina-Sochi. Zhemchuzhina-Sochi representatives were welcomed by Aleksander Gornostayev, the Vice President of Olimpstroy state company, and Timur Madjitov, the director of Sochi branch of Ingeokom JSC, as well as Sergey Kameniy, the chief engineer of stadium construction site. The meeting began with viewing of a video presentation of stages of construction of the stadium and other Olympic sites. The construction management provided information about all Olympic sites, their designation and functions. 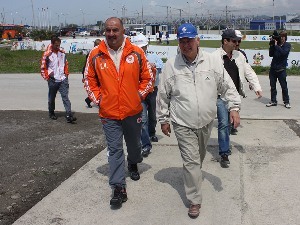 Zhemchuzhina-Sochi coach Stanislav Cherchesov in turn thanked Olimpstroy and Ingeokom for their invitation and noted that it was a particular honor for football players to appear at such sites. “This particularly applies to those players in our team, who will make every effort to play at the World Cup 2018. I am sure that there are and will be such players in our team”, said Cherchesov. After that the team visited the construction site and viewed the foundation of stadium stands, followed by a friendly game against employees of Olimpstroy and Ingeokom. The game ended in draw 2-2. After that a joint photo session on the construction site has followed. The parties reached agreement on future cooperation. FC Zhemchuzhina-Sochi invited Olimpstroy and Ingeokom employees to the home game of FC Zhemchuzhina-Sochi against FC Nizhny Novgorod on June 7, and Olimpstroy invited Zhemchuzhina to visit Olympic sites in Krasnaya Polyana.